It seems as though in the wake of the success of Crash Bandicoot N.Sane Trilogy, which initially launched for PlayStation 4 but has since released for multiple platforms, Activision is looking to create another remaster from the same franchise. Rumours of a big game announcement at The Game Awards this Friday, the 7th of December, at 1.30PM GMT have been floating around for about a week. Today Hollie Bennett, a presenter for PlayStation Access, posted a photo on her Twitter hinting at what the game could be. Bennett received a pair of large fluffy dice with a card saying, “Sliding into the Game Awards on 6/12 – Anonymous”. The dice are similarly coloured to the protagonist of the Crash games, Crash Bandicoot, and the use of the word ‘sliding’ hints at one of the most overpowered abilities in Crash Team Racing. Crash Team Racing originally launched for the Playstation 1 in 1999. The game, developed by Naughty Dog, was a Playstation exclusive and cult classic among anyone who played it. The game is high on the list of remaster requests for anyone who’s played Crash Bandicoot N.Sane Trilogy, but even in its current state it’s played religiously by many gamers. Activision have declined to comment on the tease, which is to be expected given the secret nature of this hint sent to a well-known Playstation-focussed influencer. 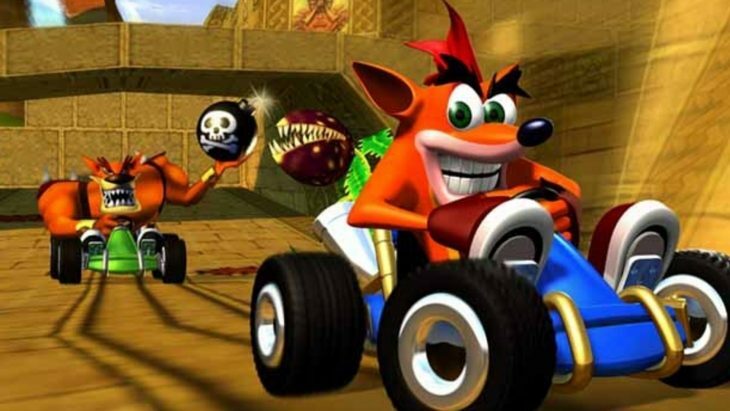 Playstation Access even streamed Crash Team Racing recently, as one of their presenters believes that not only are they unbeatable at it, but that it’s the best kart racing game on the market. Mario Kart 8 Deluxe has been somewhere near the top of most game sales charts since it launched. The original Mario Kart is also considered a cult classic, and through each iteration has gained more and more fans. Even if what Activision announce is a sequel to the beloved Crash Team Racing, there’s no doubt that it will sell at least as well as Crash Bandicoot N.Sane Trilogy did, if not better with a host of brand new fans to the series. The Game Awards begin on December 6th, and so far a number of games are set to be announced during the event as millions tune in to watch it.